Mid-drive for my DeltaWolf or how to haul 314 lbs up a 9% grade. Over the last couple of weeks I’ve had several conversations with my son, David, about the difficulty of pedaling my recumbent trike up hills. Because of the extremely mild winter I’ve been able to put in many weeks of training but I’ve not been making the progress that I think I should. I know I am now 68 and have some heart issues and maybe 20 pounds overweight. I’m not using these as excuses, I’ve been very athletic all my life and should be able to overcome all of these issues within certain perimeters. I know I’ll not be able to reach some of the fitness levels that I’ve had at other points of my life, but I feel that I should be able to reach a level of fitness that will allow me to perform acceptably for bike touring. My goal is to have me and my equipment fit enough for 50 miles per day with 4 on and 1 off. Right now I feel like back in my weight lifting days. Lifting more weight than I am ready for, burning my muscles at the beginning of the workout and toast for the balance of the workout. As soon as I pull out of my driveway it is uphill. By the time I make this climb, I am toast for the rest of the ride. I feel I would be better off doing more reps with lighter weights or a higher cadence in a lower gear. So if not me, what then? It’s got to be the equipment. So let’s take a look at what I have and what can be changed to help reach my goals. My trike at present is a homemade Atomic Zombie DeltaWolf with 26 inch rear wheels. Most commercial delta trikes have 20 inch rear wheels and that makes a big difference on the hills. Greenspeed’s new delta trike even has 16 inch wheels. I would like to keep the 26 inch wheels for ride comfort, looks and top end speeds. It has a front chain ring of 24 teeth and rear cog of 28 for it’s lowest gear. That gives me a 22 gear inch low gear. My other studies lead me to believe I need to be down around 18-19 gear inches. That is where some of the commercial delta trikes are also. I’ve even read of some trikes with mid-drives in the 11 gear inch range. While surfing for other information I ran across this Human Power Load Calculator at Bikes At Work. This calculator told me that a reasonably fit person should be able pull 314 lbs up a 9% grade at 3.5 mph using .3 hp. This 314 lbs comes from my 195 lbs of body weight, 70 lb trike and 49 lbs of camping equipment, food and water. Reducing any of these weights would add to your speed. I’m trying to stay on the conservative side so there is no surprises later. Using my 26″ wheels and 24 tooth chain ring, the calculator tells me I need a 36 tooth rear cog. This would give me 17 gear inches and 3.6 mph with a cadence of 70. The only gear clusters with a 36 we could find are 10 speed. I don’t want the problems of the der for the 10 speed and I have a minimum amount of ground clearance for a long der. I have 2 other options. Change the 26″ rear wheels to 20″ wheels and loose some top end but save some weight or install a mid-drive on the trike to get my granny gears.. In my mind, the mid-drive would give me the best of both worlds and it’s an easy install. A check of the gear inch calculator tells me I will easily get an overkill of 11 gear inches and up from there. I think this is the direction we will go. We have a couple of 6 speed rear clusters to work with. As soon as I work out the details of the mid-drive I’ll post here. As soon as I have pics of the install I’ll post on Atomic Zombie. At this point I’d like to inject a point. This mid-drive is just an easy way to get the gear range needed to climb hills and have gears needed for speed also. There are ways to custom build freewheels and chain rings that may cover your needed range of gears. If I was riding a lighter weight bike I would find another way other than a mid-drive. Mid-drives just make an easy installation on a heavy trike to get the gear range needed to climb hills. I know that 3.5 mph is not very fast but it is a speed and will eventually get you there. I’ve heard it said that “I can walk that fast”. But can you walk that fast carrying 314 pounds up a 9% grade? I may be slow but I’ll still meet you on the other side. I read of some 13% and 14% grades also. Be prepared. I read of one person’s idea of putting a little red wagon tongue on the front for pulling his trike uphill. I’ve thought of a harness over my shoulders and a rope. Whatever it takes, right? After I wrote the above post, I made a trip to my sons house to install the mid-drive. We started talking before working and made a decisions to try something else. From a LBS I picked up a megarange 6 speed freewheel with a 34 tooth low gear. That put me at about 18 gear inches. I’ll soon change out the BB and also put on a new triple chainring with a 20 tooth low gear. This will put me at about 14.6 gear inches. This approach made chain management much easier. I may later change out the the 6 speed freewheel with a 10 speed freewheel that has a 36 tooth low gear and a smoother spread of gears. Hope this help’s with your next project. We may get stuck in our own little world from time to time. There could be several reasons for staying in our comfort world. Time constraints, content with our world and other reasons we stay where we’re at. Towards the end of my mental list was lack of knowledge. I didn’t know the other world was out there. I didn’t go exploring . I have my bookmarks that I check at intervals. I have my daily bookmarks, my weekly bookmarks, my occasional bookmarks and my bookmarks that I don’t remember why I bookmarked them bookmarks. These bookmarks fill my quest for knowledge, entertainment, communication and stuff that just eats up my time. This morning I was bookmarked out. I found nothing to entertain me or fulfill my my quest for knowledge, so I started following the bookmarks of others. I see they have bookmarks that I’ll bet they don’t remember why they bookmarked them also. The Holler It site had a link to The On-line Bike Touring Tips site that I found both entertaining and informative. I think it will take me multiple visits to the well done site for me to read all that it has to offer. Great stuff if your into bike touring. I can’t wait to try out Armchair Bike Touring the online bike touring game. BikeTouringTips.com is a website dedicated to Bicycle Touring containing 1976 entries indexed by Location and Category so you can easily find exactly what you are looking for! The site has tips, website links, articles, tour journals and information from around the world. You can even add your tips and journals after a free registration. During the last few months I’ve read hundreds of journals of bicycle tours across the USA and quite a few in other countries. I’m an early riser and oft I fill my early morning hours reading these journals. The past two mornings I read the adventures of the Fast America…the 2011 edition by America By Bicycle touring organization. The riders in this tour are way out of my league, traveling 3600 miles in 31 days. That’s more than a century a day minus a couple of rest days. My plans are more like 90 days of lollygagging around seeing the sites, meeting people and writing about the people I meet along the way. I’ll bet these sadistic people beat their thumbs with hammers each morning before they leave to take their minds off the pain they suffer during the day while riding back to back to back 100 mile days. I picture myself more as a Bob Phillips the Texas Country Reporter on a comfy recumbent trike. When the camera is on, Bob Phillips is so laid back. Two guys I have always admired and wished I had a gig like theirs is Bob Phillips and Norm Abram of The New Yankee Workshop. Of course I don’t know what their real lives are like, but to watch them on TV I would think these guys are living their dream. Think anyone wants to pay me to ride a bike, sleep in a tent and smile all the time like I like it. I will. Just remember, if you want to sponsor this tour, I’m a fair weather rider. I don’t like cold weather and I really don’t like cold wet weather. I consider anything under 50 cold and anything under 70 cold if it’s raining. I’ve read of others having a mild winter this year where they live. East Texas fits into that category, we’ve had a very mild winter. Seldom have we had freezing nights and most days top out in the 50’s and 60’s for highs and even a few scattered days in the 70’s. I know it’s still only February and there is still plenty of time for bad weather to come. I ride most days except for today. Today it is raining and under 70. So I’ll call it a rest day. Sometimes in the winter I have to have several rest days in a row while I wait for milder weather. I looked at the weather report this morning to see if it was going to stop raining early enough to go for a ride today, but it looks like it will rain all day. But tomorrow is another day as the forecast is for sunny skies and 60 degrees. In fact it says 60’s and 70’s for the next 10 days. That’s the way I planned it, rest day today and ride for the next 10 days. I hope it’s good where you are today, if not, call it a rest day and go back to bed. Yesterday was a warm and foggy day. I had not ridden my normal route for a couple of days because of the rain and somewhat cooler weather. About noon the fog lifted and the sun came out, butterflies flitted and I felt it was time to ride. One problem, my trike had been outside during this wet weather spell and the seat was still wet. I didn’t relish sitting on the wet seat so I grabbed Sue’s mountain bike and off I went up the lane from my house to the county road. As I ride passed the recumbent trike it looked sad and I almost felt like I was cheating on someone or something. Sue’s mountain bike is really a little small for me but it felt good. I stopped and adjusted the seat height and off I went. I took a right and up skunk hill I rode. In my mind I was thinking this was easy. I could sit in the saddle and spin up the hill without standing on the pedals as the aluminum frame bike felt light under me compared to my much heavier trike. I topped the hill and started upshifting to higher gears as my speed increased down the long decent to the Wood’s place. The mountain bike is only a 7 speed and before the bottom of the hill I was wishing for more gears. A Bike! A Bike! A man on a bike! As I near county road 859 I make a U-turn and head back up the long descent I had just made. Still in the saddle and spinning easily I ride past the Wood’s place. I always know when I’m riding in front of the Wood’s place. There is a flock (?) 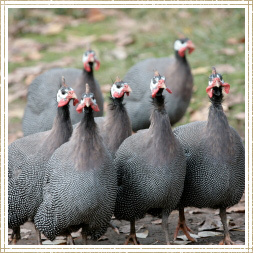 of guineas that run the fence line honking and squawking and sounding their alarm to the owner that there was a passing man on a bike. I wish everyone in the country used guineas as guard dogs instead of big dogs. I don’t mind being chased by a guinea. It’s about this point, little more than a mile into my ride that I begin to notice that my head feels heavy and I’m shifting my position in the saddle. By the top of the hill my neck is hurting and I’m trying to sit up in the saddle for relief. By the end of 2 miles, my neck, shoulders and arms are in pain. By the end of 3 miles I decide that gel cell seats are of no use. By the end of 4 miles I’m laughing to myself and saying “Just let me get back home recumbent trike, I’ll never cheat on you again.” At the end of 5 miles I’ve had it and head for the house. At one time when I was young, in my mid 40″s, 5 miles was a warm up for the 50 miles that followed. But as we grow older, things don’t come as easily as they once did. I hope from my ride yesterday I learn that weight of a bike is important. This mountain bike is not a light weight. It’s a Walmart upper line made of aluminum, but still heavy when put in perspective of more costly bikes. But, compared to my DIY recumbent trike, it is light. I also learned that having the correct gears for the bike is important. It felt great feeling the power of the lower gears on the mountain bike as I spin uphill. Riding the mountain bike just re-affirms what I’ve felt for a long time, I need lower gears for my trike. Either change the 26 inch tires to 20’s or put in a mid-drive. I’ve got to work on that. I know it takes time to adjust to most bikes. Most bikes this week being a mountain bike. I think it would take some time for me to ever adjust to an upright bike again. My recumbent trike may be a little on the heavy side. It may be geared a little high for the hills I have around my house. It still a nice bike and I love riding it daily and when I get back from a 2 hour ride, nothing hurts. I may be tired and my legs wobbly, but I’m not taking Advil at 8 o’clock to relieve the pain in my shoulders so I can get to sleep. It’s 2 o’clock and the sun is shinning, time to ride. Hope she’s not still mad. I’ll reararange this in a post that reads a little better at a later date. Just finding all the information that I can now. From time to time I refer to this article on the Cycle Genius web site about The Real History of the Recumbent. This posting is just to make it easier for me to find. You might enjoy it also. Here is another site that I love. www.Mochet.org There are many links from this site to others of interest. Somewhat off topic for this site, but still interesting is the Microcar Museum . Some of the Mochet bicycle cars had motors. There are a lot of videos on this site, some of the cars I remember from when I was a young man. I was digging through some Finish web sites looking for examples of bikes, trikes and velo’s build of wood when I stumbled across this awesome site from post war Finland. “Human powered vehicles were almost the only way of going fast in after-war Finland. And fast we went – in many different ways! The velocars were every boy’s dreams in the late 40’s and early 50’s.” I am so glad that someone preserved this piece of velomobile history in PDF format. I think you will enjoy reading about the wooden wheels because they had no tires and other hardships of post war. This account also includes a wonderful amphibike that made it across the Baltic Sea. Take a look, I know you’ll enjoy. What do you do while you ride your bike? What do you do while you ride your bike? I know, you watch traffic and that’s important. You watch the scenery. One of the main reasons why we go on bike rides. You talk to a friend. What a great way to spend a few hours, on your bike talking with friends. You talk to yourself, if alone. Some of the best conversations I’ve ever had have been with me while riding my bike. I know myself so well I almost know what I’m going to say before I say it. What a great way to spend the afternoon, talking with someone you love so much. We’re close. But what do you do subconsciously while you ride? You know, like when you drum your pencil eraser rapidly on the desk and it drives someone else in the room CRAZY. You don’t even know your doing it until they go CRAZY on you. Or someone that endlessly whistles a tune that no one has ever heard while they work. That drives me CRAZY. But what do you do while you ride your bike and your convinced there will be no more traffic? You’ve grown board with the scenery. You’ve said everything you have to say to your friends and your discussion with yourself has come to a dead end. Then what do you do for the next 30 miles or so? Huh? What then? I count. When I take car trips, I count. I count fence post. I’ll be up to 3,338 when what I’m counting in my subconscious floats to my consciousness. Somehow I make it go away by consciously thinking about something else and then next thing you know I’m back up to 3,338 again. I count anything, driveways, telephone poles, on coming cars, cars with their headlights on and cars with their headlights off. Did you know that there are 21 telephone poles per mile on level ground. I count. While I ride my bike, I count pedal strokes. You know, One . . . , Two . . . , Three . . . , Four . . . , Five . . . , I know you ride faster than that. 1, 2, 3, 4, 5. I count consciously when climbing. I guess to divert my attention from the burning in my legs. Anything to make the hill go away, and the pain. I hope someday I improve enough that I can count faster on the hills like you. I’m not the only one that counts. I recently read the journal of the “Group of Six” that rode their bikes from east to west across the US. The author of the journal counts pedal strokes also. Pedal strokes per mile and then calculates how many strokes on his 4,300 mile trip across the USA. Over 2,000,000 pedal strokes it was. That’s a lot of pedal counting. What do you do while you ride? You can leave your subconscious or conscious thoughts in the comments section. Maybe they will stay there and not follow you on your next ride. Don’t read the comments of others, you have enough on your subconscious mind now.